PARIS, France - A series of unprecedented attacks on popular night spots in Paris killed at least 153 people in the 'deadliest violence' to strike France since World War II, officials have reported on Friday the 13th, November 2015 (local time). President Francois Hollande has declared a national state of emergency advise to close the country's borders after scores of people were killed in multiple gun and bomb attacks. "This is a terrible ordeal that again assails us," he said. "We know where it comes from, who these criminals are, who these terrorists are," Hollande said in a televised address. Hollande added that the attackers would be fought "without mercy". 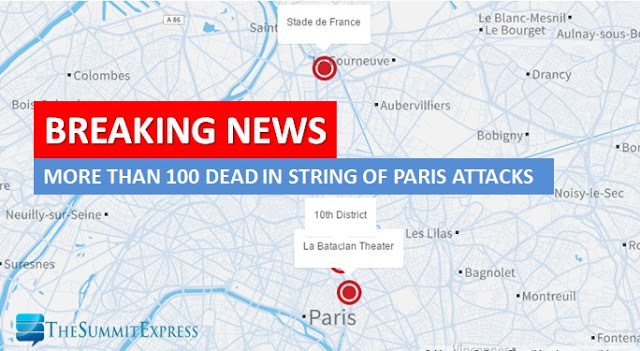 Terrorist group ISIS allegedly attacked Paris business districts which includes Bataclan concert venue at 50 boulevard Voltaire, 11th district where hostages held; Le Carillon at 18 rue Alibert, 10th district, Le Petit Cambodge, 20 rue Alibert, 10th district and La Belle Equipe, 92 rue de Charonne, 11th district where gun attacks happened. Near Stade de France, St Denis, just north of Paris, suicide attack near venue was also reported as France vs. Germany football match played. UPDATE: The Islamic State of Iraq and Syria (ISIS) has claimed responsibility for attacks in Paris. The claim was made in a statement in Arabic and French released online Saturday and circulated by supporters of the group. It was not immediately possible to confirm the authenticity of the statement, but it bore the group's logo and resembled previous statements issued by the group. Attackers reportedly used AK-47 automatic weapons. Meanwhile, U.S. Secretary of State John Kerry is describing the attacks in Paris as "heinous, evil" and "vile," calling them "an assault on our common humanity."